One of the issues that comes up for new residents in Japan is how to send money back home to the States. For me, I must pay student loans State-side. Since there is little, helpful information on the internet I thought I would start a post to document my experience with Japanese banking and foreign currency transactions. Two of the more gaijin (foreigner) friendly banks I have discovered thus far are Citibank Japan and Shinsei Bank. I currently have an account for each. While you will need a passport and foreigners card (外国人登録証明書 gaikokujin tōroku shōmeisho) sign-up for a new bank account, they do not require a Japanese hanko (registered seal) which traditional Japanese banks will require and which can be a bit of a hassle to get. **These are good banks if you are a foreigner and in Tokyo because these banks have many branches here and a few branches have English speaking staff. Outside Tokyo, I do not know. Below, I am including the screen shots of a recent transaction I had using Citibank Japan to send my paycheck to my US bank account. I use USAA in the US because they have free incoming transaction from overseas. (My credit union charges $40 for incoming overseas transactions...boo.) Keep in mind also that my current employer Berlitz has a special deal with Citibank called Citibank at Work where I can receive free overseas wire transfers for a year. 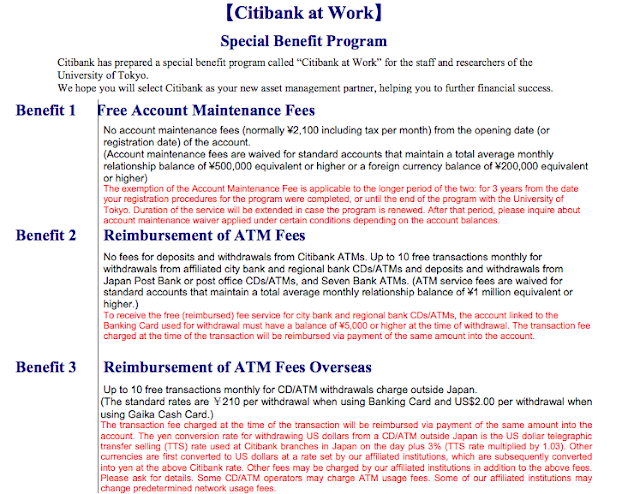 (This pdf is for University of Tokyo employees, but its similar to the program Berlitz has with Citibank). They usually charge 4,000 yen for overseas remittances (foreign transaction fees from Citibank Japan accounts to foreign bank accounts). So for about a year I will continue using Citibank Japan, after that I will have to find a better solution as I will no longer receive free wire transfers (remittances) home. Here is what my remittance looked like yesterday. I sent home 250,000 Japanese yen at a rate of 80.55 Jpy for 1 USD. Divide 250,000 yen by 80.55 and you get $3,103.66 USD. Since my transaction is free, there is no remittance fee. 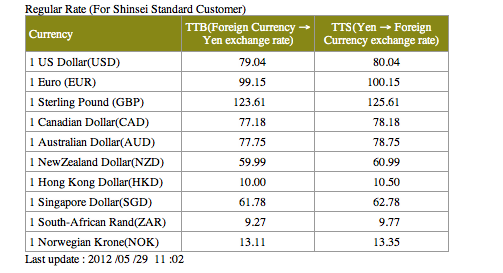 TTB is the rate from foreign currency into Yen. I am concerned about TTS. Compared to Citibank's $3,103.66, that is a difference of $20. However, Shinsei also charges 4,000 yen for the transfer so: 250,000 yen - 4,000 yen= 246,000 yen. Then divide 246,000 yen by 80.04= $3073.46 (net deposit in USD). Might not seem like much, but multiply that by 12 months a year and I will receive an extra $362 in my US bank account this year and pay off those pesky student loans just that much quicker. 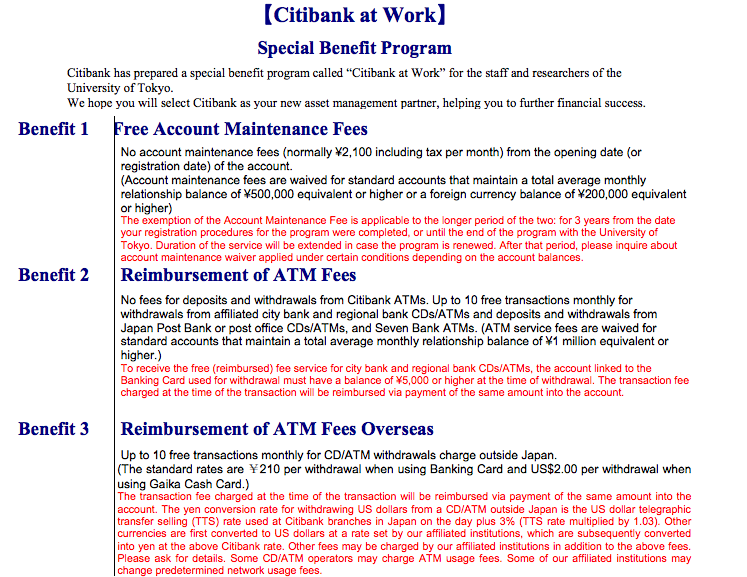 To summarize, with the Citibank at Work program I will receive an extra $362 transferring my money through Citibank Japan. However, you can see that Shinsei gives the better rate. If I did not receive the free remittances from Citibank, Shinsei would be the better choice ($20 per month better than Citibank Japan, or $240 over the course of a year). So next year, when I no longer receive free remittances (overseas wire transactions) from Citibank, I will probably use Shinsei to get a better exchange rate on my transfers. That is, unless I find a better way to transfer. I would love to hear from others in a similar situation. Comments/questions welcome. Thx for reading. Some friends recommended Golloyds (online registration possible) for remittances, so I did a quick comparison showing the amount in dollars you can receive from each bank: Golloyds, Shinsei, and Citibank. I did these calculations after deducting the various fees for each bank. Golloyds (2,000 yen) Shinsei (4,000 yen), and Citibank (4,000 yen). 250,000 yen at Golloyds becomes $3,081, $3,091.23 at Shinsei, and $3,067.33 at Citibank. Shinsei seemingly comes out on top...assuming there aren't some undiscovered fees from intermediary banks they may or may not use to make the transfers. As of Wednesday May 30th at 21:58. 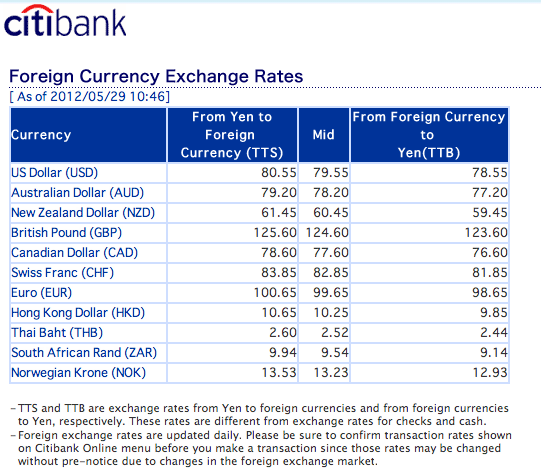 The TTS exchange rate (Yen to Dollar) is Golloyds 80.48, Shinsei 79.58, Citibank 80.20. You can check the current exchange rates for these three banks below. this is really impressed and appreciate. this is very helpful blog site. i like this kind of post. thanks for sharing. i got lot information from your site. Hi there. I'm jus now siging up for citibank seeing that the yen:dollar is out of control. what's youe take on it?